xkcd font (CC BY), Corgi Engine (licensed). I don't think I have anything new to add that hasn't already been said. The controls were a bit weird, somehow stiff and floaty at the same time. I never find it comfortable (and I know for sure I'm not the only one) using up as jump. Well, at least I could use arrows for control and W for pseudo dedicated jump button. Didn't quite feel like skateboarding at all. More like just walking and jumping. Anyways, mad props for pulling off a multiplayer of this scale and a short jam like this! Could always just add both as options. Space wasn't used for anything anyway. Good to know that you left them as configurable though. Many people just straight up ignore Unity's pretty decent input manager and just hard code the keys. Haha, you're quite right. Indeed I did not find any caches at all (besides my own ones). Pretty much just stashed my caches as high as I could get and then explored for quite a bit. It's super easy to add more keys. Just duplicate the row and slap on some different keys there. As long as they have same names, GetButton/GetAxis etc will match them all. the game was really nice, i just spent way to much time on it. finding people's geocache is very fun. my only complaint would be that you cant really play with the compass open since it take a huge part of the screen. ps: there is no ground after (10k , ~600) to the right only platforms, i went very far down and havent found it , there must be a problem with the procedural generation(didnt go -10k left to check ). some later thoughts about the game. Is there a protection against someone who would steal all the geocache and disconnect without putting them back or would the world be empty of geocaches until new players came with new ones? Also a confirmation before teleporting or quiting the game would be nice, i pressed 'q' a lot since its right next to the jump. Hello everybody! I've finished updating the game! Now it actually plays like a real game! I know that a lot of you already checked and rated the game. Still, I'd appreciate any comments on the updated version, even if you don't change your rating. Thanks! Ambitious idea for such a short jam! Enjoyed exploring and hiding caches, though I'm not sure how I feel about the goal being "get as far away from your caches as possible". I do like the idea of hiding them and trying to find them though. Not all games need a score/win component I guess. The thing with the giant world is that I imagined people exploring it a lot, as far as possible, and leaving their geocaches hidden there. But you're right: the game needs more meaningful content. It's not that way by design, but the time was simply too short to finish (my problem wasn't on the game design, but on estimating the developing time). Sweet! Please reply to this comment when it is edited so I can be reminded Thanks! I think it's done! Now the game actually makes sense as a game. If you have some time, I would appreciate honest feedback on this new version. Regards! A online multiplayer game for a weekend game jam--that is superbly ambitious, and I must congratulate you for actually completing it! :) I also love the poem joke with the controls at the beginning--that's hilarious! The gameplay is . . . ok. Moving on the ground is kind of fun. But everything I did outside of that felt . . . off. Double jumping feels stiff and awkward. And trying to land those jumps was not fun. I tried to reach the top of the screen, but I could never feel confident I was going to land on platforms that were only one square--and most of the platforms are that length. I fell a lot, and eventually gave up. Here's the weird thing: during my first playthrough, I somehow missed the fact that you could double-jump, and single-jumped the whole time. One-jumps feel good to do, even if I didn't really get anywhere (most platforms were just out of my reach!). Speaking of that, the controls and overall design of this game are both quite odd to me. 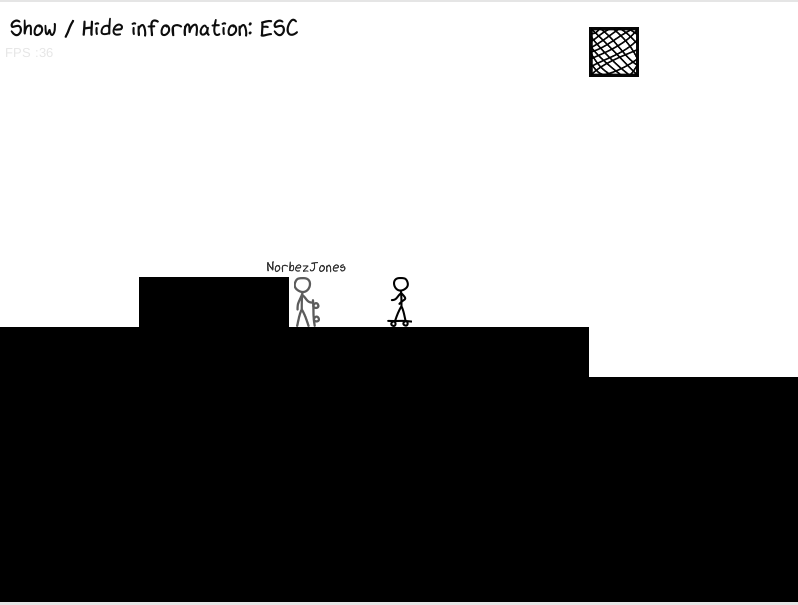 I check out the xkcd comic games are based on before I play, and I liked the fact that the game that inspired Skateboard can be controlled with just one hand (arrow keys) and that the level is structured like a 3d skating arena (because it's for a hoverboard). 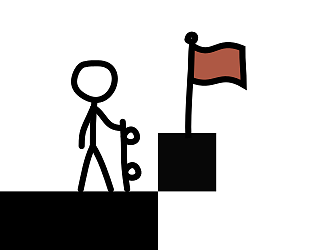 The fact that you made it a skateboard is totally fine, I have no problem with that--but it's all designed like a platformer, with nothing to do with skating at all; take away the skateboard, and is the game really that different? And the controls are a bit obtuse, though the ideas behind them are great: the ability to put down your own checkpoints, and the goal of exploring the area to maximize your distances & put down geocaches are all great ideas with odd controls to go with them. Though I do have a question: what button do you have to press to return to your checkpoint flag? Another thing I liked in the original xkcd game is that there's a goal: get the coins as fast as possible. As it stands right now, Skateboard doesn't really have a goal--yet. I can see in the description that if the game was fully finished, other players would be able to take your geocaches after you put them down. I really like this idea; it's a shame it wasn't implemented. Maybe after the jam is over? I like the stats screen. Though typing in "NorbezJonesv3" (the third time I opened the game) made me put down a balloon when I pressed "3". Also please add the controls to either the stats screen or the description; they're easy to forget and strange enough that I really did forget them. Wow, thanks a lot for the review and the encouragement! I take note on the issues you mention. If I allocate more time to the project (which will probably depend on my morale after reviews, but your comment is quite encouraging! ), I'll probably take all your suggestions into account. Some of the issues aren't by design, though, but because of time constraints. The most important is that, as you say, the game doesn't have a real goal other than toying with the exploration. While that enough generates some fun and satisfaction (like you encountering yourself! ), I know that it's still missing most of it. Sadly, the time hit me hard, and, as you also said, the project was quite ambitious (as hours passed, I noticed that it was too ambitious! ), so at one point I needed to sacrifice a lot so I could actually send something. In order to climb more effectively, one should use the checkpoint a lot, with "p" (to put it) and "i" to return to it. It's written on the poem; I hope that in my desire to make it funny, I didn't make it unclear. Thanks again for the feedback, and for playing the game! Anyway, this is just a head-up in case you've got time to give it a try :) If you do, please don't hesitate to provide your honest feedback again. That's awesome! & thanks for preserving me. ;) I'll definitely give it a look after I've commented on all the other jam games. Interesting concept for an online game, and kudos for doing an online game for a weekend game jam. Getting to the top reminds me of doodle jump somehow. The scoring mechanism is a bit obtuse, and it would be cool with more players online.